Bai Lu is going deep into the sea through Vietnam, is the pine forests of getting out of the sea, the landscape is made of very magnificent gift and inspirational poetry. It can be said Bai Lu is a "Dalat on the sea". Storage systems: There are 135 luxurious rooms divided into two areas: 79 room seaside villas, 56 villa rooms along the hill. Category: Travel Beach resort has three restaurants system is: Restaurant Chau Sa - sa pearl of the east coast (300 seats). United Sea Restaurant - flowers on the coast (300 seats). House Perfume forest - the forest flavor the east coast (200 seats). In addition to the main dish is the seafood cuisine, each restaurant has its featured products and offers a private room service. System Services: In addition to catering services, accommodation Bai Lu Resort also has extensive service system: Conference - workshops, massage, karaoke, camp fire, cultural and art, poetry club, trams, village grill, recreational fishing, squid fishing at night, love ... a bicycle tour to explore scenic and cultural traditions to learn about the history Nghe around Bai Lu. Campus system Bai Lu: Bai Lu Resort with mountain, forest, sea, system campus green as grass green tuong.Voimau of main colors, all are decorated in blue, with blue mountains, blue sea, green garden, the green of the villa gives visitors a feeling of closeness to nature. Between a third overall blue with red accents 3 restaurants. 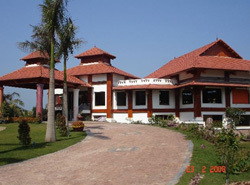 All rooms are designed with separate villas, overlooking the adjacent beach, each holiday is harmony in the system fit the campus green grass, with the chariot, clay jars, coconut shell, wood boat close space, peaceful, country folk bold place. Besides the system of trees on the campus, garden trees are structured into four levels: ground floor is the grass, the flowers lower floor, middle floor is the floor shape and plant trees to create canopy, the floor trees in a harmonious mix inseparable. A special feature intrigue for travelers is in the garden campus system has many small landscape stones, each bearing a small landscape are typical of culture rieng.Sau short time in operation, Bai Lu Resort has become a tourist destination attractions in the country, a destination resort in the quiet fresh, charming Land Art of humanity. That was the culture's own Beach Resort travel. After days of hard labor, the economic competition the market, visitors come to Bai Lu Resort to bathe in blue water of the sea, was relaxing in the luxurious villas, are rewarded form the great taste of the Creator .. Visitors are climbing on the pine forests to watch dawn or sunset on Sky Gate Lu Bai, the compression is lit incense retreat good direction the Shakyamuni Buddha Dai ... Really travelers come to with a "paradise beach"
Restaurants Chau Sa Sa as the Pearl of the east coast is a restaurant located in one central location at Bai Lu. Speciality restaurants are located right by the pool associated with romantic sea space. Tourists sitting at breakfast at the restaurant can admire Bai Lu dawn each boat racing team overcome interference. Also next to the restaurant with terrace next to the beach grass, is an ideal place to organize the event program, cultural exchange. • This is a restaurant serving breakfast for guests staying at the seaside villas. • Restaurant with private dining rooms which can accommodate from 10-40 guests. • Chau Sa not only restaurants but also match hosts events and conferences. • Restaurant located adjacent to the main reception hall of the Bai Lu. Hoa Bien Restaurant by the beach like a flower. The location is located right by the beach gives you a feeling close to nature as a meal at the restaurant. Speciality restaurants are located adjacent islands with three sides of the sea is a great place to organize culinary programs combining barbecue bonfire. • The location is ideal as a meal in the evening. • There are conference rooms for 100 guests.